The aggregate market value of the voting and non-voting common equity held by non-affiliates of the registrant as of the last business day of the second quarter (June 30, 2010) was approximately $78,632,000 based upon the last sale price of the registrants Common Stock on such date. Number of shares outstanding of Common Stock, $.01 par value, as of March 11, 2011, was 16,230,235. Statements made in this Annual Report on Form 10-K, in the Companys other SEC filings, in press releases and in oral statements to shareholders and securities analysts, which are not statements of historical or current facts, are forward-looking statements. Such forward-looking statements involve known and unknown risks, uncertainties and other factors which may cause the actual results or performance of the Company to be materially different from the results or performance expressed or implied by such forward-looking statements. The words believes, expects, anticipates, seeks and similar expressions identify forward-looking statements. Readers are cautioned not to place undue reliance on these forward-looking statements, which speak only as of the date the statement was made. These statements are subject to the risks and uncertainties that could cause actual results to differ materially and adversely from the forward-looking statements. These risks and uncertainties include, but are not limited to, the risks described in Part I, Item 1A. Insignia Systems, Inc., (the Company) markets in-store advertising products, programs and services to consumer packaged goods manufacturers (customers) and retailers. The Company has been in business since 1990. Since 1998, the Company has been focusing on providing in-store services through the Insignia Point-Of-Purchase Services (POPS) in-store advertising program. Insignia POPS® includes the Insignia POPSign® program. Insignias POPSign is a national, account-specific, in-store, shelf-edge advertising program that has been shown to deliver significant sales increases. Funded by consumer packaged goods manufacturers, the program allows manufacturers to deliver vital product information to consumers at the point-of-purchase. The brand information is combined with each retailers store-specific prices and is displayed on the retailers unique sign format. The combining of manufacturer and retailer information produces a complete call to action that gets consumers the information they want and need to make purchasing decisions, while building store and brand equity. For retailers, Insignias POPSign program is a source of incremental revenue and is the first in-store advertising program that delivers a complete call to action on a product-specific and store-specific basis, with all participating retail stores updated weekly. For consumer packaged goods manufacturers, Insignias POPSign program provides access to the optimum retail advertising site for their products  the retail shelf-edge. In addition, manufacturers benefit from significant sales increases, short lead times, micro-marketing capabilities, such as store-specific and multiple language options, and a wide variety of program features and enhancements that provide unique advertising advantages. The Companys Internet address is www.insigniasystems.com. The Company has made available on its Web site all of the reports it files with the SEC. The Companys Web site is not incorporated by reference into this Report on Form 10-K. Copies of reports can also be obtained free of charge by requesting them from Insignia Systems, Inc., 8799 Brooklyn Boulevard, Minneapolis, Minnesota 55445; Attention: CFO; telephone 763-392-6200. According to Point-Of-Purchase Advertising International (POPAI), an industry non-profit trade association, more than 70% of brand purchase decisions are being made in-store. As a result, product manufacturers are constantly seeking in-store vehicles to motivate consumers to buy their branded products. The Companys market studies indicate that the shelf-edge sign represents the final and best opportunity for manufacturers to convince the consumer to buy. In fact, a 2005 industry study concluded that shelf signs are the most effective type of in-store advertising vehicle after end-aisle displays and in-store leaflets. Many consumers seek product information beyond price in order to make educated buying decisions. The Companys marketing studies indicate the most effective sign contains information supplied by the product manufacturer in combination with the retailers price and design look. Insignias POPSign program is an in-store, shelf-edge, point-of-purchase advertising program that enables manufacturers to deliver product-specific messages quickly and accurately  in designs and formats that have been pre-approved and supported by participating retailers. Insignia POPSign delivers vital product selling information from manufacturers, such as product uses and features, nutritional information, advertising tag lines and product images. The brand information is combined with the retailers store-specific prices and is displayed on the retailers unique sign format that includes its logo, headline and store colors. Each sign is displayed directly in front of the manufacturers product in the participating retailers stores. The Companys POPSign program offers special features and enhancements, such as Advantage and Custom Advantage headers that allow manufacturers to add visibility and highlight their brand message at-shelf. The Company offers Color POPSigns with customizable, image-building full-color graphics. Insignia UltraColor® POPSigns offer 75% more area for the full-color creative than Color POPSigns. The Company sells its POPSign programs directly to consumer packaged goods manufacturers and to Valassis Sales and Marketing Services, Inc. (Valassis) for resale to consumer packaged goods manufacturers. POPSign programs are delivered to retailers participating in the Companys POPSign retail network and to retailers under contract with Valassis. Utilizing proprietary technology, the Company collects and organizes the data from manufacturers and retailers, then formats, prints and delivers the signs to its POPSign retailers and/or Valassis contracted retailers for distribution and display. Store personnel place the signs at the shelf for two-week display cycles in participating stores in Insignias contracted network of retailers. Personnel from a contracted third-party merchandising company place the signs at the shelf for two-week display cycles in participating retail stores in Valassis contracted network of retailers. The Company charges manufacturers for the signs placed in stores for each cycle. Retailers are paid a fee to display the signs and for product movement data provided to Insignia. The Company pays a fee to Valassis for each program provided to retailers under contract with Valassis. Prior to 1996, the Companys primary product offering was the Impulse Retail System, a system developed by an independent product design and development firm. In 1996, the Company replaced the Impulse Retail System with the SIGNright Sign System. In 1998, the Company ceased the active domestic sales of the SIGNright Sign System. Cardstock for the two systems is sold by the Company in a variety of sizes and colors that can be customized to include pre-printed custom artwork, such as a retailers logo. Approximately 2% of 2010 revenues came from the sale of cardstock. The Company expects this percentage to be comparable in the future. In late 1993, the Company introduced Stylus, a PC-based software application used by retailers to produce signs, labels, and posters. The Stylus software allows retailers to create signs, labels and posters by manually entering the information or by importing information from a database. Approximately 1% of 2010 revenues came from the sale of Stylus products and maintenance. The Company expects this percentage to be comparable in the future. The Company provides a comprehensive offering of laser printable cardstock and vinyl labels to retailers for their in-store signage and shelf-edge product information needs. Products include adhesive and non-adhesive supplies in a variety of colors, sizes and weights. Approximately 5% of 2010 revenues came from the sale of laser printer and vinyl label supplies. The Company expects this percentage to be comparable in the future. The Company directly markets the Insignia POPSign program to food and drug manufacturers and retailers. By utilizing the Insignia POPSign program, these manufacturers and retailers can easily accomplish what had previously been either impossible or extremely difficult: tailoring national in-store advertising programs to regional and local needs with minimal effort. In addition to the benefits provided to manufacturers and retailers, Insignias POPSign program provides consumers more information and clearer messages to aid in purchasing decisions. The Company believes its POPSign program is the most complete in-store advertising sign program available, benefiting consumer, retailer, and manufacturer. On June 12, 2006, the Company entered into an Exclusive Reseller Agreement with Valassis Sales and Marketing Services, Inc. (Valassis). The agreement had an initial term of one year with the objective of increasing the Companys sales of Insignia POPSigns. On December 6, 2006, the Company and Valassis executed Amendment No. 1 to the agreement which finalized certain appendices, made certain other modifications to the agreement and extended the initial term through December 31, 2007. On July 2, 2007 the Company and Valassis executed Amendment No. 2 to the agreement which extended the term of the agreement to December 31, 2017 and expanded the strategic alliance to increase the role of Valassis to include developing and expanding the Companys participating retailer network. In conjunction with Amendment No. 2, Valassis received a five-year warrant to acquire 800,000 shares of Insignias common stock at a price of $4.04 and will be paid cash commissions by the Company on the revenue the Company realizes from POPS programs the consumer packaged goods manufacturers conduct in the new retail chains. The Company recorded $1,521,000 of expense during the year ended December 31, 2007 related to the fair value of the warrant. On September 1, 2010, the entire warrant was exercised using the cashless exercise alternative provided for in the warrant and 281,511 shares were issued to Valassis. On June 17, 2010, the Company signed a letter of understanding with Valassis regarding Valassis’ In-Store Marketing Initiative. The letter memorialized that Valassis and the Company would collaborate in Valassis’ in-store marketing initiatives, that the Company would provide signs with price programs in SUPERVALU INC. and other retailers, and certain details regarding future retailer network development by both parties. On June 17, 2010, the Company signed an agreement with Valassis to provide signs with price content for Winn-Dixie Stores, Inc. for the term of Valassis’ agreement with Winn-Dixie. On December 29, 2010, the Company signed an agreement with Valassis to provide signs with price content for the Great Atlantic and Pacific Tea Company (A&P) for the term of Valassis’ agreement with A&P. On February 7, 2011, trial in the Company’s lawsuit against News America Marketing In-Store, LLC (News America) commenced in U.S. District Court for the District of Minnesota. On February 9, 2011, the Company and News America entered into a Settlement Agreement to settle the lawsuit. Pursuant to the Settlement Agreement, News America paid the Company $125,000,000, and the Company paid News America $4,000,000 in exchange for a 10-year arrangement to sell signs with price into News America’s network of retailers as News America’s exclusive agent. As of the date of this filing, the definitive agreement for the 10-year arrangement was still being negotiated, and had not yet been signed. If the parties cannot reach agreement, the Magistrate Judge of the U.S. District Court, District of Minnesota, will resolve any remaining issues. The Settlement Agreement included the dismissal with prejudice of the Company’s lawsuit against News America. Prior to April 1998, the Company marketed the Impulse Retail System and the SIGNright Sign System through telemarketing by in-house sales personnel and independent sales representatives. In May 1998, the Company discontinued the active marketing of the systems. The Company sells cardstock and supplies related to these systems to U.S. and international customers. The Company markets its Stylus software in the United States and internationally primarily through resellers that integrate Stylus as an Open Database Connectivity design and publishing component into their retail data and information management software applications. During 2010, 2009 and 2008, foreign sales accounted for less than 1% of total net sales each year. The Company expects sales to foreign distributors will be less than 1% of total net sales in 2011. The Insignia POPSign program is competing for the marketing expenditures of branded product manufacturers for at-shelf advertising-related signage. We face significant competition from News America and Valassis, which provide at-shelf advertising and promotional signage, plus other smaller competitors. Although the settlement with News America gives the Company additional opportunities to compete by offering signs with price in News America’s network, the Company will continue to compete for advertising dollars with News America’s other at-shelf advertising and promotional signage offerings. News America offers a network for in-store advertising, promotion and sales merchandising services. News America has branded its in-store shelf signage products as SmartSource Shelftalksm, SmartSource Shelfvisionsm and SmartSource Price Pop®. Pursuant to the confidential Settlement Agreement of the litigation against News America, the Company paid News America $4,000,000 in exchange for a 10-year arrangement to sell signs with price into News Americas network of retailers as News Americas exclusive agent. Final terms of the definitive agreement are still being negotiated. The Company licenses the right to use a patented barcode on the sign cards for the Companys Impulse and SIGNright Sign Systems. Neither revenues from this product line, nor royalties paid under the license agreement, are considered material. Key employees are required to enter into nondisclosure and invention assignment agreements, and customers, vendors and other third parties also must agree to nondisclosure restrictions prior to disclosure of our trade secrets or other confidential or proprietary information. Product development for Insignias POPSign program has been conducted internally and includes the proprietary data management and operations system, as well as the current offering of point-of-purchase and other advertising products. Ongoing internal systems enhancements, as well as the development of point-of-purchase and other advertising or promotional products, will be conducted utilizing both internal and external resources as appropriate. Product development on the SIGNright Sign System was primarily conducted by a developer on a contract basis. The Stylus software product line remains a viable application for the Companys retail customers. The Company performs development to keep Stylus current and updated to meet industry requirements. Valassis, Nestle Co., General Mills, Inc. accounted for 20%, 19%, and 15%, respectively, of the Companys total net sales for the year ended December 31, 2010. Valassis and General Mills, Inc. each accounted for 20% of the Companys total net sales for the year ended December 31, 2009. General Mills, Inc., Nestle Co., Kellogg Sales Company and Valassis accounted for 19%, 13%, 11% and 10%, respectively, of the Companys total net sales for the year ended December 31, 2008. Valassis is a reseller of the Companys POPSign program to consumer packaged goods manufacturers. Sales backlog on March 7, 2011 was approximately $5.8 million, all of which is for delivery during the remainder of 2011. The orders are believed to be firm, but there is no assurance that all of the backlog will actually result in revenues. Sales backlog on March 8, 2010 was approximately $7.5 million. The Companys results of operations have fluctuated from quarter to quarter due to variations in net sales and operating expenses. There is no seasonal pattern to these fluctuations. Professional fees related to litigation. As of February 28, 2011, the Company had 114 employees, including all full-time and part-time employees. The Company operates in a single reportable segment. Our business faces significant risks, including the risks described below. If any of the events or circumstances described in the following risks occurs, our business, financial condition or results of operations could suffer, and the trading price of our common stock could decline. Our revenues are affected by our customers marketing and advertising spending and our revenues and results of operations may be subject to fluctuations based upon general economic conditions. Another economic downturn may reduce demand for our products and services or depress pricing of those products and services and have an adverse effect on our results of operations. Retailers may be impacted by changes in consumer spending as well, which may adversely impact our ability to renew contracts with our existing retailers as well as contract with new retailers on terms which are acceptable. In addition, if we are unable to successfully anticipate changing economic conditions, we may be unable to effectively plan for and respond to those changes, and our business could be negatively affected. Although we had net income of $7,626,000, $3,716,000, and $2,343,000 for the years ended December 31, 2010, 2009, and 2007, respectively, we had a net loss of $(2,257,000) for the year ended December 31, 2008, and significant net losses for a number of years prior to December 31, 2006. There can be no assurance that we will be profitable on a quarterly or annual basis. If we are unable to generate net income from operations, our business will be adversely affected and our stock price will likely decline. On September 23, 2004, the Company brought suit against News America and Albertsons Inc. (Albertsons) in Federal District Court in Minneapolis, Minnesota, for violations of federal and state antitrust and false advertising laws, alleging that News America has acquired and maintained monopoly power through various wrongful acts designed to harm the Company in the in-store advertising and promotion products and services market. The suit sought injunctive relief sufficient to prevent further antitrust injury and an award of treble damages for the harm caused to the Company. On September 20, 2006, the State of Minnesota through its Attorney General intervened as a co-plaintiff in the business disparagement portion of the case. In December 2006, News America filed counterclaims in the case that included claims of alleged interference with contracts and alleged libel and slander against Insignia and one of its officers. On February 4, 2008, the Court approved a consent decree entered into by News America and the State of Minnesota under which News America agreed to not violate Minnesotas statutes prohibiting commercial disparagement. On July 29, 2008, the Company and Albertsons entered into a settlement agreement and mutual release, in which they each agreed to release all claims against the other, and the Company agreed to dismiss its lawsuit against Albertsons. On February 7, 2011, trial in the Companys lawsuit against News America commenced in U.S. District Court for the District of Minnesota. On February 9, 2011, the Company and News America entered into a Settlement Agreement to settle the lawsuit. Pursuant to the Settlement Agreement, News America paid the Company $125,000,000, and the Company paid News America $4,000,000 in exchange for a 10-year arrangement to sell signs with price into News Americas network of retailers as News Americas exclusive agent. As of the date of this filing, the definitive agreement for the 10-year arrangement was still being negotiated, and had not yet been signed. If the parties cannot reach agreement, the Magistrate Judge of the U.S. District Court, District of Minnesota, will resolve any remaining issues. The Settlement Agreement included the dismissal with prejudice of the Companys lawsuit against News America. The Company filed claims in December 2006 and January 2007 with its directors and officers liability and general liability insurers related to the defense costs and insurance coverage for claims asserted against the Company and one of its officers in News Americas counterclaims. On August 9, 2007, the Company filed a complaint against the insurers in Hennepin County District Court, State of Minnesota requesting a declaratory judgment that the insurers owed the Company and its officer such defense costs and insurance coverage. In December 2007, the Company settled its claim against one of the insurers. In March 2009, the Company settled with the other insurer and received a payment of $1,387,000 as part of the settlement. The Company recorded the payment in general and administrative expenses for the quarter ended March 31, 2009, and the litigation with the insurers is finished. During the year ended December 31, 2010, the Company incurred legal fees of $1,851,000 related to the News America litigation. Management expects the amount of legal fees and expenses that will be incurred in connection with the lawsuit against News America will be significant throughout the first quarter of 2011 due to trial preparation, start of the trial and settlement activities. Legal fees and expenses are expensed as incurred and are included in general and administrative expenses in the statements of operations. The Company is subject to various other legal proceedings in the normal course of business. Management believes the outcome of these proceedings will not have a material adverse effect on the Companys financial position or results of operations. On an ongoing basis, we negotiate renewals of various retailer contracts. Some of our retailer contracts require us to guarantee minimum payments. If we are unable to offer guarantees at the required levels in the new contracts, and the contracts are not renewed because of that or because of other reasons, it will have a material adverse effect on our operations and financial condition. Our POPS business and results of operations could be adversely affected if the number of retailer partners decreases significantly or if the retailer partners fail to continue to perform their duties in placing and maintaining POPSigns at the shelf in their stores and providing product movement data to us. Our contract with The Kroger Co. expired on December 31, 2010, which could have a material adverse impact on our business. competitive conditions in our industry. Due to these factors, our quarterly and annual net sales, expenses and results of operations could vary significantly in the future and this could adversely affect the market price of our common stock. We face significant competition from News America and Valassis, which provide at-shelf advertising and promotional signage. Although the settlement with News America gives the Company additional opportunities to compete by offering signs with price in News America’s network, the Company will continue to compete for advertising dollars with News America’s other at-shelf advertising and promotional signage offerings. News America and Valassis have significantly greater financial resources that can be used to market their products. Should our competitors succeed in obtaining more of the at-shelf advertising business from our current customers, our revenues and related operations would be adversely affected. We are largely dependent on our POPS program, which represented approximately 91%, 93% and 92% of total net sales for fiscal 2010, 2009 and 2008, respectively. We expect the POPS program to represent a higher percentage in fiscal 2011 and future periods. Should brand manufacturers no longer perceive value in the POPS program, our business and results of operations would be adversely affected due to our heavy dependence on this program. We are largely dependent on the net sales from our POPSigns, which are purchased by branded product manufacturers. Changes in economic conditions could result in reductions in advertising and promotional expenditures by branded product manufacturers. Should these reductions occur, our revenues and related results of operations would be adversely affected. Our product manufacturer customers use our POPS program to motivate consumers to buy their branded products. Use of our POPS program has historically resulted in sales increases for that particular product. If our POPS program does not continue to result in these product sales increases, our marketing success and sales levels could be adversely affected. On June 12, 2006, the Company entered into an Exclusive Reseller Agreement with Valassis Sales and Marketing Services, Inc. (Valassis). The agreement had an initial term of one year with the objective of increasing the Companys sales of Insignia POPSigns. On December 6, 2006, the Company and Valassis executed Amendment No. 1 to the agreement which finalized certain appendices, made certain other modifications to the agreement and extended the initial term through December 31, 2007. On July 2, 2007 the Company and Valassis executed Amendment No. 2 to the agreement which extended the term of the agreement to December 31, 2017 and expanded the strategic alliance to increase the role of Valassis to include developing and expanding the Companys participating retailer network. On June 17, 2010, the Company signed a letter of understanding with Valassis regarding Valassis’ In-Store Marketing Initiative. The letter memorialized that the Company would provide signs with price programs in SUPERVALU INC. and other retailers, and certain details regarding future retailer network development by both parties. Our partnership thus far has resulted in increased revenues for the Company. If our partnership with Valassis is terminated for any reason, our revenue levels and our participating retailer network could be adversely affected. Our results will depend on the success of our sales and marketing efforts for signs with price into the News America network of retailers as News Americas exclusive agent and upon our ability to successfully integrate the operational aspects of the programs. Although we have completed the documentation and testing of the effectiveness of our internal control over financial reporting for fiscal 2010, as required by Section 404 of the Sarbanes-Oxley Act of 2002, we expect to incur continuing costs, which may include increased accounting fees and increased staffing levels, in order to maintain compliance with the Sarbanes-Oxley Act. In addition, our ability to integrate the operations of other companies that we may acquire in the future could impact our compliance with Section 404. In the future, if we fail to complete the Sarbanes-Oxley 404 evaluation in a timely manner, or if our independent registered public accounting firm cannot attest in a timely manner to the effectiveness of our internal controls, we could be subject to regulatory scrutiny and a loss of public confidence in our internal controls. In addition, any failure to implement required new or improved controls, or difficulties encountered in their implementation, could harm our operating results or cause us to fail to meet our reporting obligations. The Company currently leases approximately 41,000 square feet of office and warehouse space in suburban Minneapolis, Minnesota, through February 29, 2016. The Company believes that the 41,000 square feet of space will meet the Companys foreseeable needs. On September 23, 2004, the Company brought suit against News America Marketing In-Store, LLC (News America) and Albertson’s Inc. (Albertson’s) in Federal District Court in Minneapolis, Minnesota, for violations of federal and state antitrust and false advertising laws, alleging that News America has acquired and maintained monopoly power through various wrongful acts designed to harm the Company in the in-store advertising and promotion products and services market. The suit sought injunctive relief sufficient to prevent further antitrust injury and an award of treble damages for the harm caused to the Company. On September 20, 2006, the State of Minnesota through its Attorney General intervened as a co-plaintiff in the business disparagement portion of the case. In December 2006, News America filed counterclaims in the case that included claims of alleged interference with contracts and alleged libel and slander against Insignia and one of its officers. On February 4, 2008, the Court approved a consent decree entered into by News America and the State of Minnesota under which News America agreed to not violate Minnesota’s statutes prohibiting commercial disparagement. On July 29, 2008, the Company and Albertson’s entered into a settlement agreement and mutual release, in which they each agreed to release all claims against the other, and the Company agreed to dismiss its lawsuit against Albertson’s. During the year ended December 31, 2010, the Company incurred legal fees of $1,851,000 related to the News America litigation. Management expects the amount of legal fees and expenses to be incurred in connection with the lawsuit against News America will be significant throughout the first quarter of 2011 due to trial preparation, start of the trial and settlement activities. Legal fees and expenses are expensed as incurred and are included in general and administrative expenses in the statements of operations. The Companys common stock trades on the NASDAQ Capital Market® under the symbol ISIG. The following table summarizes the high and low sale prices per share of our common stock for the periods indicated as reported on the Nasdaq System. As of February 28, 2011, the Company had one class of Common Stock beneficially held by approximately 2,100 owners. As of December 31, 2010, the Company had never paid a cash dividend on its common stock. On February 22, 2011, the Board declared a one-time special dividend of $2.00 per share to shareholders of record as of April 1, 2011, payable May 2, 2011. Since this special dividend exceeds 25% of the Company’s stock price, in accordance with applicable NASDAQ rules, the ex-dividend date will be May 3, 2011, one day following the payment date. Outside of this special dividend, the Board of Directors presently intends to retain all earnings for use in the Company’s business and does not anticipate paying cash dividends in the foreseeable future. On February 23, 2010, the Board of Directors authorized the repurchase of up to $2,000,000 of the Company’s common stock on or before January 31, 2011. The plan terminated on January 31, 2011. On February 22, 2011, the Board of Directors authorized the repurchase of up to $15,000,000 of the Companys common stock on or before January 31, 2012, under a new plan. The plan does not obligate the Company to repurchase any particular number of shares, and may be suspended at any time at the Companys discretion. The following graph compares the cumulative total shareholder return on the Companys Common Stock for the five fiscal years beginning December 31, 2005 and ending December 31, 2010, with the cumulative total return on the NASDAQ Stock Market  U.S. Index and the Russell 2000 Index over the same period (assuming the investment of $100 in the Companys Stock, the NASDAQ Stock Market  U. S. Index and the Russell 2000 Index on December 31, 2005 and the reinvestment of all dividends). The information required by Item 5 concerning compensation plans under which securities may be issued is incorporated herein by reference to the Companys proxy statement for its 2011 Annual Meeting of Shareholders, which will be filed with the Securities and Exchange Commission pursuant to Regulation 14A within 120 days after the close of the fiscal year for which this report is filed. The following table sets forth selected financial data for each of the five years ended December 31, 2010. The operations and balance sheet data for the years ended and as of December 31, 2010, 2009, 2008, 2007 and 2006 are derived from our audited financial statements. The following information should be read in conjunction with Managements Discussion and Analysis of Financial Condition and Results of Operations and with our financial statements and the related notes thereto included elsewhere in this report. Includes a tax benefit of $6,704 primarily related to the release of the valuation allowance against deferred tax assets more fully described in Note 6 to the financial statements. Includes one-time cash proceeds of $1,387 from the settlement of a claim against one of the Companys insurers more fully described in Note 4 to the financial statements. Includes tax expense of $2,131 related to the increase of the valuation allowance against deferred tax assets more fully described in Note 6 to the financial statements. The following discussion should be read in conjunction with the financial statements and the related notes included in this Report. This Report contains forward-looking statements that involve risks and uncertainties. Our actual results could differ materially from those in such forward-looking statements as a result of many factors, including those discussed in Forward-Looking Statements and elsewhere in this Report. The Company does not believe that the recession during 2007 to 2009 and the subsequent slow pace of recovery has had a significant effect on its results of operations for the year ended December 31, 2010. The Company may be adversely affected by the economic environment in the future if spending levels of its customers are reduced or it is unable to renew contracts with existing retailers or contract with new retailers on terms which are acceptable. Our discussion of our financial condition and results of operations is based upon our financial statements, which have been prepared in accordance with accounting principles generally accepted in the United States. During the preparation of these financial statements, we are required to make estimates and assumptions that affect the reported amounts of assets, liabilities, net revenues, costs and expenses and related disclosures. On an ongoing basis, we evaluate our estimates and assumptions, including those related to revenue recognition, allowance for doubtful accounts, income taxes, and stock-based compensation expense. We base our estimates on historical experience and on various other assumptions that we believe are reasonable under the circumstances. The results of our analysis form the basis for making assumptions about the carrying values of assets and liabilities that are not readily apparent from other sources. Actual results may differ from these estimates under different assumptions or conditions, and the impact of such differences may be material to our consolidated financial statements. Revenue Recognition. The Company recognizes revenue from Insignia POPSigns ratably over the period of service, which is typically a two-week display cycle. We recognize revenue related to equipment, software and sign card sales at the time the products are shipped to customers. Revenue associated with maintenance agreements is recognized ratably over the life of the contract. Revenue that has been billed and not yet recognized is reflected as deferred revenue on our balance sheet. Allowance for Doubtful Accounts. An allowance is established for estimated uncollectible accounts receivable. The Company determines its allowance by considering a number of factors, including the length of time trade accounts receivable are past due, the Companys previous loss history, the customers current ability to pay its obligation to the Company, the condition of the general economy and the industry as a whole and other relevant facts and circumstances. Unexpected changes in the aforementioned factors could result in materially different amounts. Income Taxes. Deferred income taxes are determined based on the estimated future tax effects of differences between the financial statement and tax basis of assets and liabilities given the provisions of enacted tax laws. Deferred income tax provisions and benefits are based on changes to the assets or liabilities from year to year. In providing for deferred taxes, we consider tax regulations of the jurisdictions in which we operate, estimates of future taxable income, and available tax planning strategies. If tax regulations, operating results or the ability to implement tax-planning strategies vary, adjustments to the carrying value of deferred tax assets and liabilities may be required. Valuation allowances are recorded related to deferred tax assets based on the more likely than not criteria. We recognize the financial statement benefit of a tax position only after determining that the relevant tax authority would more likely than not sustain the position following an audit. For tax positions meeting the more-likely-than-not threshold, the amount recognized in the financial statements is the largest benefit that has a greater than 50 percent likelihood of being realized upon ultimate settlement with the relevant tax authority. During the year ended December 31, 2010 the Company recorded a $7,913,000 net release of the valuation allowance. The release is due to the expectation of future taxable income as a result of the News America Marketing lawsuit settlement on February 9, 2011. In light of the settlement the Company believes it is more likely than not that its deferred tax assets will be realized in 2011and thereafter. Stock-Based Compensation. We measure and recognize compensation expense for all stock-based payments at fair value. We use the Black-Scholes option pricing model to determine the weighted average fair value of options and employee stock purchase plan rights. The determination of fair value of share-based payment awards on the date of grant using an option-pricing model is affected by our stock price as well as by assumptions regarding a number of highly complex and subjective variables. These variables include, but are not limited to, the expected stock price volatility over the term of the awards, and actual and projected employee stock option exercise behaviors. The expected terms of the options and employee stock purchase plan rights are based on evaluations of historical and expected future employee exercise behavior. The risk-free interest rate is based on the U.S. Treasury rates at the date of grant with maturity dates approximately equal to the expected life at grant date. Volatility is based on historical and expected future volatility of the Companys stock. The Company has not historically issued any dividends and does not expect to in the future. Forfeitures are estimated at the time of the grant and revised, if necessary, in subsequent periods if actual forfeitures differ from estimates. If factors change and we employ different assumptions in the valuation of grants in future periods, the compensation expense that we record may differ significantly from what we have recorded in the current periods. The following table sets forth, for the periods indicated, certain items in the Companys Statements of Operations as a percentage of total net sales. Net Sales. Net sales for the year ended December 31, 2010 increased 4.3% to $30,007,000 compared to $28,770,000 for the year ended December 31, 2009. Service revenues from our POPSign programs for the year ended December 31, 2010 increased 2.1% to $27,231,000 compared to $26,666,000 for the year ended December 31, 2009. The increase was primarily due to an increase in the average sign price which was partially offset by a decrease in the number of signs placed. The expiration of the retailer contract with The Kroger Co. on December 31, 2010, could have a material adverse impact on service revenues for the 2011 year. The positive impact of the arrangement to sell signs with price into News Americas network of retailers cannot be determined at this time. Product sales for the year ended December 31, 2010 increased 31.9% to $2,776,000 compared to $2,104,000 for the year ended December 31, 2009. The increase was primarily due to increased sales of laser sign card and label supplies based on increased demand for these products from one of our customers, offset by lower sales of thermal sign card supplies and Stylus software based upon decreased demand for these products from our customers. Gross Profit. Gross profit for the year ended December 31, 2010 decreased 1.1% to $15,171,000 compared to $15,341,000 for the year ended December 31, 2009. Gross profit as a percentage of total net sales decreased to 50.6% for 2010 compared to 53.3% for 2009. Gross profit from our POPSign program revenues for the year ended December 31, 2010 decreased 2.8% to $14,248,000 compared to $14,652,000 for the year ended December 31, 2009. The decrease in gross profit of $404,000 was primarily due to an increase in retailer expenses, which more than offset the effect of increased services revenues. Gross profit as a percentage of POPSign program revenues decreased to 52.3% for 2010 compared to 55.0% for 2009, due primarily to the increase in retailer expenses. Gross profit from our product sales for the year ended December 31, 2010 increased 34.0% to $923,000 compared to $689,000 for the year ended December 31, 2009. Gross profit as a percentage of product sales increased to 33.3% for 2010 compared to 32.8% for 2009. The increases were primarily due to increased sales and the effect of fixed costs. Selling. Selling expenses for the year ended December 31, 2010 increased 6.8 % to $7,082,000 compared to $6,632,000 for the year ended December 31, 2009, primarily due to increased POPS staffing levels and increased travel related expenses. Selling expenses as a percentage of total net sales increased to 23.6% in 2010 compared to 23.0% in 2009, primarily due to the factors described above. Marketing. Marketing expenses for the year ended December 31, 2010 increased 6.2% to $1,635,000 compared to $1,540,000 for the year ended December 31, 2009, primarily due to increased staffing related expenses. Marketing expenses as a percentage of total net sales increased to 5.5% in 2010 compared to 5.4% in 2009, primarily due to the factors described above. General and Administrative. General and administrative expenses for the year ended December 31, 2010 increased 15.3% to $5,549,000 compared to $4,811,000 for the year ended December 31, 2009, primarily due to increased staffing levels, travel related expenses, and increased legal costs related to the News America litigation. General and administrative expenses as a percentage of total net sales increased to 18.5% in 2010 compared to 16.7% in 2009, primarily due to the factors described above. Legal fees were $2,081,000 for the year ended December 31, 2010 compared to $1,838,000 for the year ended December 31, 2009. The legal fees in each year were incurred primarily in connection with the News America litigation described elsewhere herein. Management expects the amount of legal fees and expenses that will be incurred in connection with the lawsuit against News America will be significant throughout the first quarter of 2011in connection with trial preparation, commencement of the trial and settlement activities. Insurance Settlement Proceeds. The Company received a payment of $1,387,000 in the first quarter of 2009 from an insurer as part of a settlement of the Companys claim that the insurer owed the Company defense costs for claims asserted against the Company and one of its officers in the News America litigation. Other Income (Expense). Other income (net) for the year ended December 31, 2010 was $17,000 compared to other income (net) of $86,000 for the year ended December 31, 2009. Included in other income (net) was interest income of $39,000 for the year ended December 31, 2010 compared to interest income of $127,000 for the year ended December 31, 2009. Interest income for the 2010 year was lower due to significantly lower interest rates which more than offset the effect of higher average cash, cash equivalent and short-term investment balances in 2010. Lower interest expense of $22,000 for the year ended December 31, 2010 versus $40,000 for the year ended December 31, 2009 was due to scheduled principal payments made in 2009 to reduce amounts owed to a retailer. Income Taxes. During the year ended December 31, 2010 the Company recorded a $7,913,000 net release of the valuation allowance. The release is due to the expectation of future taxable income as a result of the News America Marketing lawsuit settlement on February 9, 2011. In light of the settlement the Company believes it is more likely than not that these deferred tax assets will be realized in 2011. The Company recorded income tax expense of $115,000 for the year ended December 31, 2009, related to alternative minimum tax liability. Net Income. The net income for the year ended December 31, 2010 was $7,626,000 compared to $3,716,000 for the year ended December 31, 2009. Net Sales. Net sales for the year ended December 31, 2009 decreased 8.4% to $28,770,000 compared to $31,406,000 for the year ended December 31, 2008. Service revenues from our POPSign programs for the year ended December 31, 2009 decreased 7.8% to $26,666,000 compared to $28,931,000 for the year ended December 31, 2008. The decrease was primarily due to a decrease in the number of POPSign programs executed for customers (consumer packaged goods manufacturers) during the 2009 period as a result of the loss of Safeway, Inc. from our network of retailers at December 31, 2008 when the contract with Safeway, Inc. expired. Product sales for the year ended December 31, 2009 decreased 15.0% to $2,104,000 compared to $2,475,000 for the year ended December 31, 2008. The decrease was primarily due to decreased sales of thermal sign card supplies, laser sign card and label supplies, and Stylus software based upon decreased demand for these products from our customers. Gross Profit. Gross profit for the year ended December 31, 2009 decreased 9.1% to $15,341,000 compared to $16,884,000 for the year ended December 31, 2008. Gross profit as a percentage of total net sales decreased to 53.3% for 2009 compared to 53.8% for 2008. Gross profit from our POPSign program revenues for the year ended December 31, 2009 decreased 8.4% to $14,652,000 compared to $16,002,000 for the year ended December 31, 2008. The decrease in gross profit of $1,350,000 was primarily due to decreased sales which was partially offset by decreased retailer expenses and printing expenses. Gross profit as a percentage of POPSign program revenues decreased to 55.0% for 2009 compared to 55.3% for 2008, due primarily to the effect of fixed costs and the effect of retailer expenses which did not decrease as significantly as sales. Gross profit from our product sales for the year ended December 31, 2009 decreased 21.9% to $689,000 compared to $882,000 for the year ended December 31, 2008. Gross profit as a percentage of product sales decreased to 32.8% for 2009 compared to 35.6% for 2008. The decreases were primarily due to decreased sales and the effect of fixed costs. Selling. Selling expenses for the year ended December 31, 2009 decreased 22.2% to $6,632,000 compared to $8,521,000 for the year ended December 31, 2008, primarily due to decreased sales commissions. The decreased sales commissions were due to decreased POPSign program sales and a sales incentive to our strategic partner (Valassis) present only in 2008 which was triggered by a year-over-year increase in sales to specific customers. Selling expenses as a percentage of total net sales decreased to 23.0% in 2009 compared to 27.1% in 2008, primarily due to the factors described above. Marketing. Marketing expenses for the year ended December 31, 2009 decreased 3.9% to $1,540,000 compared to $1,602,000 for the year ended December 31, 2008, primarily due to decreased data acquisition expense. Marketing expenses as a percentage of total net sales increased to 5.4% in 2009 compared to 5.1% in 2008, primarily due to the factors described combined with the effect of decreased sales in 2009. General and Administrative. General and administrative expenses for the year ended December 31, 2009 decreased 31.9% to $4,811,000 compared to $7,060,000 for the year ended December 31, 2008, primarily due to decreased legal costs related to the News America litigation and decreased facility related expenses which were partially offset by additional staff expenses. General and administrative expenses as a percentage of total net sales decreased to 16.7% in 2009 compared to 22.5% in 2008, primarily due to the factors described above in relation to decreased sales. Legal fees were $1,838,000 for the year ended December 31, 2009 compared to $4,234,000 for the year ended December 31, 2008. The legal fees in each year were incurred primarily in connection with the News America litigation described elsewhere herein. Other Income (Expense). Other income (net) for the year ended December 31, 2009 was $86,000 compared to other income (net) of $180,000 for the year ended December 31, 2008. Included in other income (net) was interest income of $127,000 for the year ended December 31, 2009 compared to interest income of $234,000 for the year ended December 31, 2008. Interest income for the 2009 year was lower due to lower interest rates which more than offset the effect of higher average cash balances in 2009. Lower interest expense of $40,000 for the year ended December 31, 2009 versus $57,000 for the year ended December 31, 2008 was due to scheduled principal payments made in 2009 to reduce amounts owed to a retailer. Income Taxes. The Company recorded income tax expense for the year ended December 31, 2009 of $115,000 compared to $2,138,000 for the year ended December 31, 2008. The Company continued to carry a full valuation allowance against its net deferred tax asset at December 31, 2009, and had therefore recorded income tax expense of $115,000 for 2009 which was related to alternative minimum taxes. The Company recorded income tax expense for the year ended December 31, 2008, of $2,138,000 as a result of increasing the valuation allowance against the deferred tax assets by $1,930,000, recording expense of $201,000 from changes in the deferred tax assets and recognizing $7,000 of current income tax expense related to state tax liabilities. Net Income (Loss). The net income for the year ended December 31, 2009 was $3,716,000 compared to a net loss of $(2,257,000) for the year ended December 31, 2008. The Company has financed its operations with proceeds from public and private stock sales and sales of its services and products. At December 31, 2010, working capital was $12,505,000 compared to $10,716,000 at December 31, 2009. During the year ended December 31, 2010, cash, cash equivalents, and short-term investments increased by $499,000 from $13,197,000 at December 31, 2009 to $13,696,000 at December 31, 2010. Net cash provided by operating activities during the year ended December 31, 2010, was $839,000. Net income of $7,626,000 minus net non-cash income of $5,682,000 totaling $1,944,000 for the year ended December 31, 2010, more than offset changes in operating assets and liabilities which used cash of $1,105,000. The net non-cash income of $5,682,000 consisted of stock-based compensation expense and depreciation which was more than offset by an income tax benefit. The most significant component of the $1,105,000 change in operating assets and liabilities was deferred revenue. Deferred revenue decreased by $971,000 primarily due to programs which had been invoiced on December 31, 2009 and which executed in 2010. The Company expects accounts receivable, accounts payable, accrued liabilities and deferred revenue to fluctuate during future periods depending on the level of POPSign revenues and related business activity as well as billing arrangements with customers and payment terms with retailers. Net cash of $3,513,000 was provided by investing activities during the year ended December 31, 2010, due to short-term investment activity which was partially offset by purchases of property and equipment. Purchases of short-term investments of $3,800,000 and proceeds of $7,700,000 during the year consisted entirely of purchases and redemptions of twenty-six week certificates of deposit. Net purchases of property and equipment totaled $387,000 during the year ended December 31, 2010, and consisted of information technology equipment, software and digital printing equipment as well as leasehold modifications. The Company expects to make capital expenditures of approximately $2,078,000 in 2011 consisting primarily of additional printing technologies and information technology equipment. Net cash of $47,000 was provided by financing activities during the year ended December 31, 2010. Proceeds (net) of $735,000 resulting from the issuance of common stock from the employee stock purchase plan and the employee stock option plans were partially offset by the repurchase of common stock of $469,000 (net) pursuant to a plan adopted on February 23, 2010, and the payment of $219,000 of principal on long-term liabilities. On February 9, 2011, the Company entered into a settlement agreement in its lawsuit against News America. As part of the settlement agreement News America paid the Company $125,000,000 less $4,000,000 related to a ten year business arrangement. Litigation counsel for the Company received a contingent fee payment of $31,250,000 which resulted in a net cash payment to the Company of $89,750,000. After performance bonus plan payments of $3,987,500 and estimated federal and state income taxes of $27,762,500 (utilizing the Company’s net operating loss carry forwards), net settlement proceeds are approximately $58,000,000. The Board of Directors on February 22, 2011 approved a series of actions. First, the Board of Directors authorized a special $2.00 per common share dividend which will result in an estimated payment of $35,000,000. Second, the Board approved a Performance Bonus Plan, providing for the payment of $3,987,500 to certain employees of the Company. Third, the Board authorized the repurchase of up to $15,000,000 of the Company’s common stock on or before January 31, 2012. The plan does not obligate the Company to repurchase any particular number of shares, and may be suspended at any time at the Company’s discretion. The Company believes that based upon current business conditions, its existing cash balance (including proceeds from the settlement) and future cash from operations will be sufficient for its cash requirements in the foreseeable future. However, there can be no assurances that this will occur or that the Company will be able to secure additional financing from public or private stock sales or from other financing agreements if needed. In December 2009, the Financial Accounting Standards Board (FASB) issued Accounting Standards Update (ASU) No. 2010-06, Fair Value Measurements and Disclosures Topic 820 Improving Disclosures about Fair Value Measurements. This ASU requires some new disclosures and clarifies some existing disclosure requirements about fair value measurement as set forth in Codification Subtopic 820-10. The FASBs objective is to improve these disclosures and, thus, increase the transparency in financial reporting. Some of the new disclosures are effective for reporting periods beginning after December 15, 2009, with the remaining new disclosures effective for reporting periods beginning after December 15, 2010. The adoption of this ASU will not have a material impact on our financial statements. In July 2010, the FASB issued ASU No. 2010-20, Receivables Topic 310 Disclosures about the Credit Quality of Financing Receivables and the Allowance for Credit Losses, to enhance the disclosures required for financing receivables (for example, loans, trade accounts receivable, notes receivable, and receivables relating to a lessors leveraged, direct financing, and sales-type leases) and allowances for credit losses. The amended disclosures are designed to provide more information to financial statement users regarding the credit quality of a creditors financing receivables and the adequacy of its allowance for credit losses. The amended guidance is effective for period-end balances beginning with the first interim or annual reporting period ending on or after December 15, 2010. The amended guidance is effective for activity during a reporting period beginning on or after December 15, 2010. The Company adopted the amended guidance and it did not have a significant impact on the Companys financial statements. *On an ongoing basis, the Company negotiates renewals of various retailer agreements, some of which provide for fixed or store-based payments rather than sign placement-based payments. Upon the completion of renewals, the annual commitment amounts could be in excess of the amounts above. We have audited the accompanying balance sheets of Insignia Systems, Inc. (a Minnesota corporation) (the Company) as of December 31, 2010 and 2009, and the related statements of operations, shareholders equity and cash flows for each of the three years in the period ended December 31, 2010. These financial statements are the responsibility of the Companys management. Our responsibility is to express an opinion on these financial statements based on our audits. 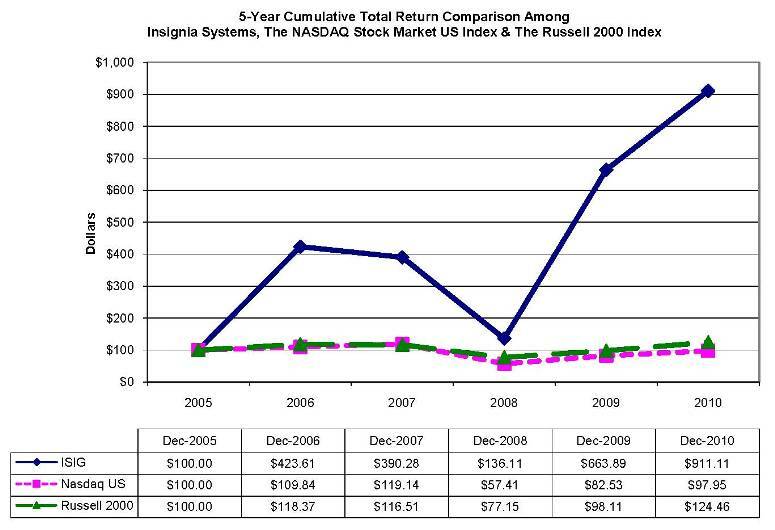 In our opinion, the financial statements referred to above present fairly, in all material respects, the financial position of Insignia Systems, Inc. as of December 31, 2010 and 2009, and the results of its operations and its cash flows for each of the three years in the period ended December 31, 2010, in conformity with accounting principles generally accepted in the United States of America. We also have audited, in accordance with the standards of the Public Company Accounting Oversight Board (United States), Insignia Systems, Inc.s internal control over financial reporting as of December 31, 2010, based on criteria established in Internal Control  Integrated Framework issued by the Committee of Sponsoring Organizations of the Treadway Commission (COSO) and our report dated March 16, 2011, expressed an unqualified opinion. We have audited Insignia Systems, Inc. (a Minnesota corporation) (the Company) internal control over financial reporting as of December 31, 2010, based on criteria established in Internal ControlIntegrated Framework issued by the Committee of Sponsoring Organizations of the Treadway Commission (COSO). The Companys management is responsible for maintaining effective internal control over financial reporting and for its assessment of the effectiveness of internal control over financial reporting, included in the accompanying Managements Annual Report on Internal Control Over Financial Reporting. Our responsibility is to express an opinion on the effectiveness of the Companys internal control over financial reporting based on our audit. In our opinion, Insignia Systems, Inc. maintained, in all material respects, effective internal control over financial reporting as of December 31, 2010, based on criteria established in Internal ControlIntegrated Framework issued by COSO. We also have audited, in accordance with the standards of the Public Company Accounting Oversight Board (United States), the balance sheets of Insignia Systems, Inc. as of December 31, 2010 and 2009, and the related statements of operations, shareholders equity and cash flows for each of the three years in the period ended December 31, 2010, and our report dated March 16, 2011, expressed an unqualified opinion on those financial statements. Description of Business. Insignia Systems, Inc. (the Company) markets in-store advertising products, programs and services to retailers and consumer packaged goods manufacturers. The Companys products include the Insignia Point-of-Purchase Services (POPS) in-store advertising program, thermal sign card supplies for the Companys SIGNright and Impulse systems, Stylus software and laser printable cardstock and label supplies. Revenue Recognition. Revenues are recognized by the Company when persuasive evidence of an arrangement exists, shipment has occurred, the price is fixed, and collectability is reasonably assured. The Company recognizes revenue from Insignia POPSigns ratably over the period of service. The Company recognizes revenue related to equipment, software and sign card sales at the time the products are shipped to customers. Revenue associated with maintenance agreements is recognized ratably over the life of the contract. Revenue that has been billed and not yet earned is reflected as deferred revenue on the Balance Sheet. Cash and Cash Equivalents. The Company considers all highly liquid investments with an original maturity date of three months or less to be cash equivalents when purchased. Cash equivalents are stated at cost, which approximates fair value. At December 31, 2010, $5,001,000 was invested in an overnight repurchase account and $7,400,000 was invested in certificates of deposit. At December 31, 2009, $2,733,000 was invested in an overnight repurchase account and $6,400,000 was invested in certificates of deposit. The balances in cash accounts, at times, may exceed federally insured limits. The Company has not experienced any losses in such accounts and believes it is not exposed to any significant credit risk on cash and cash equivalents. Amounts held in checking accounts during the years ended December 31, 2010 and 2009, were fully insured under the Federal government’s Temporaty Liquidity Guarantee Program. Amounts held in repurchase accounts during the years ended December 31, 2010 and 2009, were invested in Ginnie Mae mortgage securities which were backed by the full faith and credit guaranty of the United States government. Bank certificates of deposit at December 31, 2010 and 2009, were held at various institutions with amounts at each institution at or below the $250,000 insured limit of the Federal Deposit Insurance Corporation. Short-Term Investments. Short-term investments consist of short-term bank certificates of deposit with original maturities of between three and twelve months. These short-term investments are classified as held to maturity and are valued at cost which approximates fair value. Bank certificates of deposit at December 31, 2010, were held at various institutions with amounts at each institution at or below the $250,000 insured limit of the Federal Deposit Insurance Corporation. Fair Value of Financial Instruments. The financial statements include the following financial instruments: cash and cash equivalents, short-term investments, accounts receivable, and accounts payable. The financial instruments approximate fair value because of the short-term nature of these instruments. The fair value of our bank certificates of deposit are deposits with original maturities of between three and twelve months and are valued based on our cost which approximates fair value. Accounts Receivable. The majority of the Companys accounts receivable is due from companies in the consumer packaged goods industry. Credit is extended based on evaluation of a customers financial condition and, generally, collateral is not required. Accounts receivable are due within 30-90 days and are stated at amounts due from customers net of an allowance for doubtful accounts. Accounts receivable outstanding longer than the contractual payment terms are considered past due. The Company determines its allowance by considering a number of factors, including the length of time trade accounts receivable are past due, the Companys previous loss history, the customers current ability to pay its obligation to the Company, and the condition of the general economy and the industry as a whole. The Company writes-off accounts receivable when they become uncollectible, and payments subsequently received on such receivables are credited to the allowance for doubtful accounts. Leasehold improvements are amortized over the shorter of the remaining term of the lease or estimated life of the asset. Impairment of Long-Lived Assets. The Company records impairment losses on long-lived assets used in operations when indicators of impairment are present and the undiscounted cash flows estimated to be generated by those assets are less than the assets carrying amount. Impaired assets are then recorded at their estimated fair market value. There were no impairments during the years ended December 31, 2010, 2009 and 2008. Income Taxes. Income taxes are accounted for under the liability method. Deferred income taxes are provided for temporary differences between the financial reporting and tax basis of assets and liabilities. Deferred taxes are reduced by a valuation allowance when, in the opinion of management, it is more likely than not that some portion or all of the deferred tax asset will not be realized. Deferred tax assets and liabilities are adjusted for the effects of changes in tax laws and rates on the date of the enactment. It is the Companys policy to provide for uncertain tax positions and the related interest and penalties based upon managements assessment of whether a tax benefit is more likely than not to be sustained upon examination by tax authorities. Stock-Based Compensation. The Company measures and recognizes compensation expense for all stock-based payments at fair value. We use the Black-Scholes option pricing model to determine the weighted average fair value of options and employee stock purchase plan rights. The determination of fair value of share-based payment awards on the date of grant using an option-pricing model is affected by our stock price as well as by assumptions regarding a number of complex and subjective variables. These variables include, but are not limited to, the expected stock price volatility over the term of the awards, and actual and projected employee stock option exercise behaviors. Advertising Costs. Advertising costs are charged to operations as incurred. Advertising expenses were approximately $3,000, $11,000 and $11,000 during the years ended December 31, 2010, 2009 and 2008. Net Income (Loss) Per Share. Basic net income (loss) per share is computed by dividing net income (loss) by the weighted average shares outstanding and excludes any dilutive effects of options, warrants and convertible securities. Diluted net income per share gives effect to all diluted potential common shares outstanding during the year. Options and warrants to purchase approximately 551,000, 1,852,000 and 2,186,000 shares of common stock with weighted average exercise prices of $7.44, $4.53 and $4.89 were outstanding at December 31, 2010, 2009 and 2008 and were not included in the computation of common stock equivalents because their exercise prices were higher than the average fair market value of the common shares during the reporting periods. For the year ended December 31, 2008, the effect of options and warrants was anti-dilutive due to the net loss incurred during the period. Had net income been achieved, approximately 381,000 of common stock equivalents would have been included in the computation of diluted net income per share for the year ended December 31, 2008. Use of Estimates. The preparation of financial statements in conformity with accounting principles generally accepted in the United States requires management to make estimates and assumptions that affect the amounts reported in the financial statements and accompanying notes. Actual results could differ from these estimates. New Accounting Pronouncements. In December 2009, the Financial Accounting Standards Board (FASB) issued Accounting Standards Update (ASU) No. 2010-06, Fair Value Measurements and Disclosures Topic 820 Improving Disclosures about Fair Value Measurements. This ASU requires some new disclosures and clarifies some existing disclosure requirements about fair value measurement as set forth in Codification Subtopic 820-10. The FASBs objective is to improve these disclosures and, thus, increase the transparency in financial reporting. Some of the new disclosures are effective for reporting periods beginning after December 15, 2009, with the remaining new disclosures effective for reporting periods beginning after December 15, 2010. The adoption of this ASU will not have a material impact on our financial statements. Long-Term Liabilities. In prior periods, the Company reached an agreement with a retailer for the deferred payment of certain obligations on an interest-free basis. These obligations are recorded as long-term liabilities with an imputed annual interest rate of 10.0%. Operating Leases. The Company conducts its operations in a leased facility. In October 2007 the Company entered into agreements to terminate its previous facility lease and sublease effective July 31, 2008. On March 27, 2008, the Company entered into an operating lease for its current facility which is in effect from August 2008 through February 2016. The Company also leased equipment under operating lease agreements effective through September 2009. Rent expense under all of these leases, net of sub-lease rental income, was approximately $446,000, $451,000 and $546,000 for the years ended December 31, 2010, 2009 and 2008. Retailer Agreements. The Company has contracts in the normal course of business with various retailers, some of which provide for fixed or store-based payments rather than sign placement-based payments. During the years ended December 31, 2010, 2009 and 2008, the Company incurred $3,324,000, $3,017,000 and $4,935,000 of costs related to fixed and store-based payments. The amounts were recorded in Cost of Services in the Statements of Operations. On an ongoing basis the Company negotiates renewals of various retailer agreements. Upon the completion of future contract renewals, the annual commitment amounts for 2011 and thereafter could be in excess of the amounts above. Legal. On September 23, 2004, the Company brought suit against News America Marketing In-Store, LLC (News America) and Albertsons Inc. (Albertsons) in Federal District Court in Minneapolis, Minnesota, for violations of federal and state antitrust and false advertising laws, alleging that News America has acquired and maintained monopoly power through various wrongful acts designed to harm the Company in the in-store advertising and promotion products and services market. The suit sought injunctive relief sufficient to prevent further antitrust injury and an award of treble damages to be determined at trial for the harm caused to the Company. On September 20, 2006, the State of Minnesota through its Attorney General intervened as a co-plaintiff in the business disparagement portion of the case. In December 2006, News America filed counterclaims in the case that included claims of alleged interference with contracts and alleged libel and slander against Insignia and one of its officers. On February 4, 2008, the Court approved a consent decree entered into by News America and the State of Minnesota under which News America agreed to not violate Minnesotas statutes prohibiting commercial disparagement. On July 29, 2008, the Company and Albertsons entered into a settlement agreement and mutual release, in which they each agreed to release all claims against the other, and the Company agreed to dismiss its lawsuit against Albertsons. During the year ended December 31, 2010, the Company incurred legal fees of $1,851,000 related to the News America litigation. Management expects the amount of legal fees and expenses that will be incurred in connection with the ongoing lawsuit against News America will be significant throughout the first quarter of 2011 as trial preparation continued, the trial began and as activities related to the settlement occurred. Legal fees and expenses are expensed as incurred and are included in general and administrative expenses in the statements of operations. Warrants. On July 2, 2007, the Company issued a warrant to purchase 800,000 shares of the Companys common stock to Valassis Sales and Marketing Services, Inc. (Valassis) at a price of $4.04 for a term of five years. The warrant was issued for services to develop and expand the Companys participating retailer network in conjunction with Amendment No. 2 to the Exclusive Reseller Agreement which defines the terms of the strategic sales alliance between the Company and Valassis. The Company recorded $1,521,000 of expense related to the fair value of the warrant. The Black-Scholes option-pricing model was used to estimate the fair value of the warrant using an expected life of 5 years, volatility of 40%, a dividend yield of 0% and a risk-free interest rate of 4.9%. On September 1, 2010, the entire warrant was exercised using the cashless exercise alternative provided for in the warrant and 281,511 shares were issued to Valassis. Stock-Based Compensation. The Companys stock-based compensation plans are administered by the Compensation Committee of the Board of Directors, which selects persons to receive awards and determines the number of shares subject to each award and the terms, conditions, performance measures and other provisions of the award. The Company uses the straight-line attribution method to recognize expense for unvested options. The amount of share-based compensation recognized during a period is based on the value of the awards that are ultimately expected to vest. Forfeitures are estimated at the time of grant and revised, if necessary, in subsequent periods if actual forfeitures differ from those estimates. The Company will re-evaluate the forfeiture rate annually and adjust it as necessary. As of December 31, 2010, there was $519,000 of total unrecognized compensation costs related to the outstanding stock options which is expected to be recognized over a weighted average period of 1.1 years. Stock Options. Prior to 2003 the Company had a stock option plan (the 1990 Plan) for its employees and directors under which substantially all of the shares reserved for issuance had been issued. During May 2003, the Companys shareholders approved the 2003 Incentive Stock Option Plan (the 2003 Plan) and through December 31, 2010, a total 2,875,000 shares of common stock have been reserved for issuance. The 2003 Plan replaced the 1990 Plan. Options granted under the 1990 Plan will remain in effect until they are exercised or expire according to their terms. All current option grants are made under the 2003 Plan. Under the terms of the stock option plans, the Company grants incentive or non-qualified stock options to employees and directors generally at an exercise price at or above 100% of fair market value at the close of business on the date of grant. The stock options expire five or ten years after the date of grant and generally vest over three years. Options outstanding under the Option Plans expire at various dates during the period May 2011 through May 2020. Options outstanding at December 31, 2010 had a weighted average remaining life of 5.82 years and an aggregate intrinsic value of $8,525,000. Options exercisable at December 31, 2010 had a weighted average remaining life of 4.93 years and an aggregate intrinsic value of $7,008,000. The weighted average grant-date fair value of options granted during the years ended December 31, 2010, 2009 and 2008, were $2.23, $1.55 and $1.01. Employee Stock Purchase Plan. The Company has an Employee Stock Purchase Plan (the Plan) that enables employees to contribute up to 10% of their base compensation toward the purchase of the Companys common stock at 85% of market value. During the years ended December 31, 2010, 2009 and 2008, employees purchased 143,493, 59,634 and 39,914 shares under the Plan. At December 31, 2010, 202,536 shares are reserved for future employee purchases of common stock under the Plan. For the years ended December 31, 2010, 2009 and 2008, the Company recognized $80,000, $77,000 and $67,000 of stock-based compensation expense related to the Plan. Stock Repurchase Plan. On February 23, 2010, the Board of Directors authorized the repurchase of up to $2,000,000 of the Companys common stock on or before January 31, 2011. The plan does not obligate the Company to repurchase any particular number of shares, and may be suspended at any time at the Companys discretion. At December 31, 2010, 85,000 shares had been repurchased. On February 22, 2011, the Board of Directors authorized the repurchase of up to $15,000,000 of the Companys common stock on or before January 31, 2012. The plan does not obligate the Company to repurchase any particular number of shares, and may be suspended at any time at the Companys discretion. At December 31, 2010, the Company had net operating loss carryforwards of approximately $18,616,000, which are available to offset future taxable income. The Company has determined that these carryforwards are not currently subject to the limitations of Internal Revenue Code Section 382 which provides limitations on the availability of net operating losses to offset current taxable income if an ownership change has occurred. These carryforwards will begin expiring in 2018. At December 31, 2010, the Company had indefinite-lived alternative minimum tax credit carryforwards of $125,000. During the year ended December 31, 2010 the Company recorded a $7,913,000 net release of the valuation allowance. The release was due to the expectation of future taxable income as a result of the News America Marketing lawsuit settlement on February 9, 2011.During the year ended December 31, 2009, the Company recorded a $701,000 net release of the valuation allowance related to the utilization of loss carryforwards and determined that it was still more likely than not that none of the remaining deferred tax assets would be realized. During the year ended December 31, 2008, the Company recorded a $1,930,000 net increase to the valuation allowance due to changes in the Companys expectations regarding its ability to realize certain deferred tax assets, which resulted from a determination that it was more likely than not that none of the deferred tax assets would be realized. The Company evaluates all significant available positive and negative evidence, including the existence of losses in recent years and its forecast of future taxable income, in assessing the need for a valuation allowance. The underlying assumptions the Company uses in forecasting future taxable income require significant judgment and take into account the Companys recent performance. The tax benefit related to the full release of the valuation allowance against deferred tax assets for the year ended December 31, 2010 was $6,704,000. The tax benefit of the remaining deferred tax assets will be recognized in the future. Included as part of the Companys net operating loss carryforwards are approximately $2,700,000 in tax deductions that resulted from the exercise of stock options. When these loss carryforwards are realized the corresponding changes in the valuation allowance will be recorded as additional paid-in capital. The Company has determined that no liability is required to be recognized for uncertain tax positions taken in tax returns. The Company files income tax returns in the United States and numerous state and local tax jurisdictions. Tax years that are open for examination and assessment by the Internal Revenue Service are 2007 through 2010. With limited exceptions, tax years prior to 2007 are no longer open in major state and local tax jurisdictions. Employee Benefit Plans. The Company sponsors a Retirement Profit Sharing and Savings Plan under Section 401(k) of the Internal Revenue Code. The plan allows employees to defer up to 50% of their wages, subject to Federal limitations, on a pre-tax basis through contributions to the plan. During the years ended December 31, 2010, 2009 and 2008 the Company made a matching contribution of $84,000, $77,000 and $71,000, respectively. Major Customers. During the year ended December 31, 2010 three customers accounted for 20%, 19% and 15% of the Companys total net sales. At December 31, 2010, these three customers represented 11%, 26%, and 6% of the Companys total accounts receivable. During the year ended December 31, 2009, two customers each accounted for 20% of the Companys total net sales. At December 31, 2009, these two customers represented 25% and 15% of the Companys total accounts receivable. Although there are a number of customers that the Company sells to, the loss of a major customer could adversely affect operating results. Additionally, the loss of a major retailer from the Companys retail network could adversely affect operating results. Export Sales. Export sales accounted for less than 1% of total net sales during the years ended December 31, 2010, 2009 and 2008. The Companys management carried out an evaluation, under the supervision and with the participation of the Companys Chief Executive Officer (principal executive officer) and the Companys Chief Financial Officer (principal financial officer), of the effectiveness of the design and operation of the Companys disclosure controls and procedures (as such term is defined in Rules 13a-15(e) and 15d-15(e) under the Securities Exchange Act of 1934, as amended) as of December 31, 2010, pursuant to Exchange Act Rule 13a-15. Based upon that evaluation, the Companys Chief Executive Officer and the Companys Chief Financial Officer concluded that the Companys disclosure controls and procedures as of December 31, 2010 were effective. Disclosure controls and procedures ensure that information required to be disclosed by us in the reports that we file or submit under the Exchange Act is recorded, processed, summarized and reported within the time periods specified in the rules and forms of the SEC, and are designed to ensure that information required to be disclosed by us in these reports is accumulated and communicated to our management, as appropriate to allow timely decisions regarding disclosures. Our management is responsible for establishing and maintaining adequate control over financial reporting, as such term is defined in Rule 13a-15(f) of the Exchange Act. Under the supervision and with the participation of our management, including our Chief Executive Officer and our Chief Financial Officer, we conducted an evaluation of the effectiveness of our internal control over financial reporting as of December 31, 2010. In conducting its evaluation, our management used the criteria set forth by the framework in Internal Control  Integrated Framework issued by the Committee of Sponsoring Organizations of the Treadway Commission. Based on that evaluation, management believes our internal control over financial reporting was effective as of December 31, 2010. Grant Thornton LLP, an independent registered public accounting firm, has issued an attestation report on our internal control over financial reporting as of December 31, 2010. The attestation report of Grant Thornton LLP, on our internal control over financial reporting as of December 31, 2010 is included in Part II, Item 8 under Reports of Independent Registered Public Accounting Firm and is incorporated by reference herein. No changes in the Companys internal control over financial reporting have occurred during the fourth quarter of 2010 that have materially affected, or are reasonably likely to materially affect, the Companys internal control over financial reporting. The information required by Item 10 concerning the directors and executive officers of the Company and corporate governance is incorporated herein by reference to the Companys proxy statement for its 2011 Annual Meeting of Shareholders, which will be filed with the Securities and Exchange Commission pursuant to Regulation 14A within 120 days after the close of the fiscal year for which this report is filed. The information required by Item 11 is incorporated herein by reference to the Companys proxy statement for its 2011 Annual Meeting of Shareholders which will be filed with the Securities and Exchange Commission pursuant to Regulation 14A within 120 days after the close of the fiscal year for which this report is filed. The information required by Item 12 is incorporated herein by reference to the Companys proxy statement for its 2011 Annual Meeting of Shareholders which will be filed with the Securities and Exchange Commission pursuant to Regulation 14A within 120 days after the close of the fiscal year for which this report is filed. The information required by Item 13 is incorporated herein by reference to the Companys proxy statement for its 2011 Annual Meeting of Shareholders which will be filed with the Securities and Exchange Commission pursuant to Regulation 14A within 120 days after the close of the fiscal year for which this report is filed. The information required by Item 14 is incorporated herein by reference to the Companys proxy statement for its 2011 Annual Meeting of Shareholders which will be filed with the Securities and Exchange Commission pursuant to Regulation 14A within 120 days after the close of the fiscal year for which this report is filed. The above persons are a majority of the Directors.